The Neuron App, combines our unique software and the Neuron blocks. Once connected, children can use the app to connect e-blocks and their corresponding Neuron nodes, and experience all sorts of fun-filled applications, without having to learn any complicated coding. It also supports AI (Artificial Intelligence) and IoT (Internet of Things) features, and comes with the corresponding Neuron nodes description cards. The Neuron nodes description cards help children to master programming logic and knowledge quickly, and apply cutting-edge technology to their daily life. We have designed our intuitive and easy to understand flow-based programming from the point of view of a child. 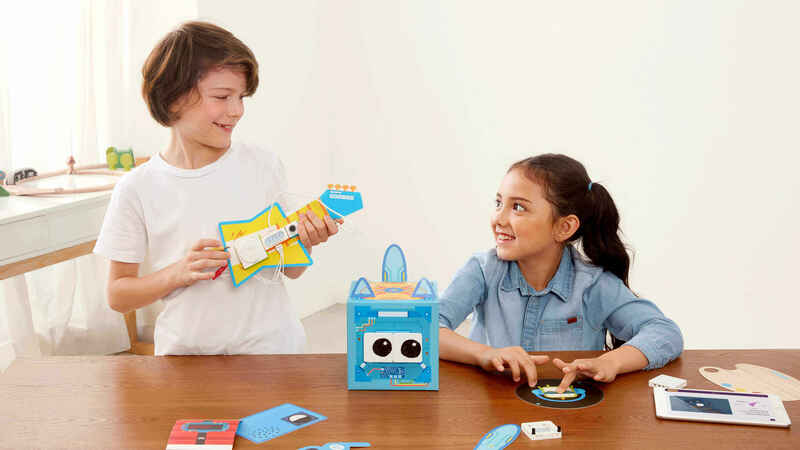 By linking together the e-blocks and joining up the Neuron nodes using an intuitive interface, children are able to experience in real-time the results produced by the app in Neuron, helping them understand programming logic, fine-tuning the way they think and transforming ideas into tangible fun-packed objects. The Neuron App contains detailed video guides on paper-based models, making it easy even for newbies to create and build their projects step-by-step. In the experience template, children can use the default program directly to interact with the paper models, and follow the video tutorials for yet more play options. Starting with the creation of a laser sword, a piano and a tail-wagging kitten, children progress from imitation to creation. The Neuron App is equipped with nodes description cards, which explain in detail the use and working principles of each node; coupled with corresponding examples and illustrations, the cards help children get started with flow-based programming and master programming logic and knowledge quickly. The cloud control functionality of the Neuron App allows any program to be uploaded and shared once completed, in the form of a webpage with a simple click for remote control. In the classroom, teachers may also use Neuron to demonstrate loT applications such as automatic light switching and soil detection. This makes teaching the application principles of IoT more tangible and intuitive. Neuron also supports AI speech and emotion recognition, giving children first-hand experience at the cutting-edge of technology ahead of others. Explanation: Compare the inputting number with a pre-configured number. 2) If the counter counts to 3, show a smiley face. Explanation: Keep the input unchanged for a period of time. 3) Let the input change gradually. Explanation: Make an irregular output every time. How it is used: The RANDOM node can generate a random number. It can be used to make a dice, or make an effect that produces a different result every time. Q1: What is the flow-based programming? 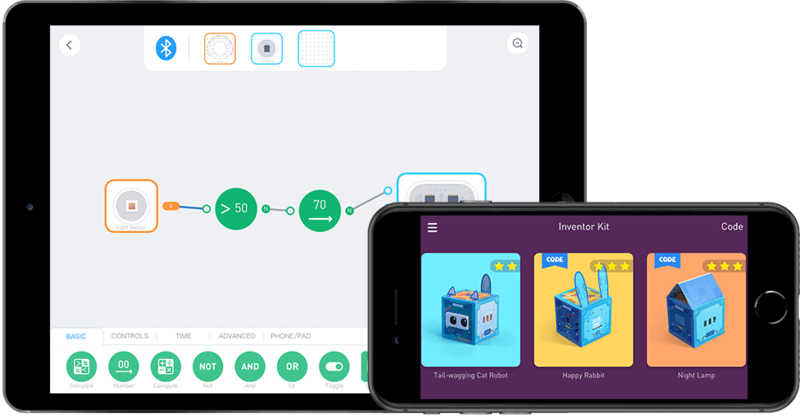 The flow-based programming gives children an easy way to learn to code. Compared with the block-based programming, the flow-based programming is easier for first-time coders to pick up from the very start. Simply by dragging lines, children can quickly program the Neuron blocks to do anything they can imagine. Q2: How does the IoT feature of Neuron work? The Neuron App has a feature that enables you to share programs with your friends. To synchronize your Neuron programs across multiple devices, you only need to drag out the “cloud” node, tap the “share” button and then scan the QR code. Also, you can use the feature to remotely control Neuron to do more things, like automatically watering flowers or automatically turning off the lights. Q3: The Bluetooth block fails to connect to the Neuron App. How do I do? 1. Make sure the Bluetooth of your phone is active and the Neuron App has been given permission to access location info. And make sure you download the latest version of Neuron App. 2. Exit the Neuron App first and make sure the software is not running in the background. Restart the app and connect the Bluetooth block to the software again. 3. The Bluetooth block has been damaged for some unknown reasons. Please contact the local distributors or online stores where you purchased the product for after-sales services. Q4: What's the password for Neuron Wi-Fi? Why can't I find the Wi-Fi name in the list? The Wi-Fi password for Neuron is “makeblock”. The password is case-sensitive. Q5: The programs stop running after I exit the Neuron App. Why? The Bluetooth block can’t store programs so you should run programs online in the Neuron App. Q6: What devices versions does the Neuron App support? The Neuron App supports IOS 9.0 or higher/ Android 4.4 or higher. Q7: How do I do to upload programs to Neuron? Use the Wi-Fi block to upload programs. Q8: I try to share my programs by scanning the QR code in the Neuron. But the app either gives no response or shows "failed to share'. What's the problem? The “share” feature requires networking so please check carefully to make sure your mobile device (phone/Pad) can access the Internet. Download: Search Neuron on App Store or Google Play .